Laparoscopic nephrectomy (LN) was first performed by Clayman et al in 1991 and has since become a standard therapy for various renal lesions. LN may be performed by a transperitoneal or retroperitoneal approach for the treatment of both benign and malignant conditions. This article describes the retroperitoneal laparoscopic nephrectomy (RLN) technique, the advantages to this approach, relevant anatomy, special instrumentation requirements, and the current literature on this subject. Urologists have historically favored a retroperitoneal approach when using open surgical interventions for both renal and adrenal lesions. By maintaining a retroperitoneal surgical field for infectious or malignant processes, the risk of peritonitis or peritoneal seeding was minimized. In addition, this approach helps control and efficiently drain any urinary leakage immediately after renal reconstructive procedures (eg, pyeloplasty, anatrophic nephrolithotomy with infundibuloplasty, partial nephrectomy). Thus, in the age of endoscopic procedures and laparoscopy, crafting surgical interventions that maintain an extraperitoneal surgical field was a natural extension. Ultimately, this evolved into surgical maneuvers that created a potential retroperitoneal space large enough to facilitate both extirpative and reconstructive procedures. The first retroperitoneoscopy was performed by Bartel et al in 1969 using a mediastinoscope. 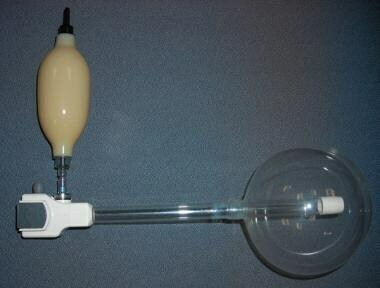 In 1991, Gauer, the father of modern day retroperitoneoscopy, developed a reliable and effective technique to create a retroperitoneal working space by using a soft inflatable balloon dilator. [3, 4] His initial clinical series of RLNs performed in a series of Indian subjects defined both a safe and effective endoscopic approach to renal lesions. With current high-definition endoscopic imaging and complimentary accessory instrumentation, retroperitoneal laparoscopic renal surgery is regularly performed for both extirpative and reconstructive renal surgery. This approach is particularly suited for radical nephrectomy. With all the advantages of maintaining an extraperitoneal surgical field, and with prompt access to the great vessels and renal vasculature, RLN provides excellent oncologic outcomes with minimal morbidity. In general, the indications for an extraperitoneal laparoscopic nephrectomy are similar to those for the intraperitoneal approach. Using a retroperitoneal approach has certain advantages over a traditional laparoscopic nephrectomy, which include prompt access to the great vessels and renal vasculature without requiring medial mobilization of solid viscus or bowel. This is particularly beneficial in the morbidly obese patient, in those who have undergone previous abdominal surgery or radiation where intra-abdominal adhesions are expected, and when renal vascular anomalies and/or neovascularity associated with a tumor mass are expected based on preoperative radiographic imaging, for which early vascular control is essential. Furthermore, owing to the lack of bowel manipulation and irritating effects of carbon dioxide on the gastrointestinal tract, the incidence of postoperative ileus and time to refeeding is far less. Additionally, the prompt access to the great vessels and renal hilum is particularly helpful when the retroperitoneum is distorted by such factors as lymphadenopathy and tumor neovascularity. 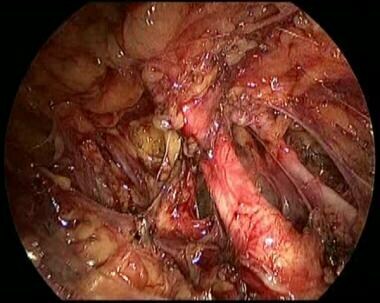 Retroperitoneal laparoscopic nephrectomy is regularly performed for both benign and malignant lesions. The decision to perform simultaneous adrenalectomy and regional lymphadenectomy is individualized but is routinely performed using this approach. Extraperitoneal laparoscopy has become the primary mode of access for adrenal lesions, including adrenal cortical carcinoma and pheochromocytoma. Renal tumor size, location, and radiographic or intraoperative evidence of lymphadenopathy do not prohibit using this procedure and are commonly facilitated by using a retroperitoneal procedure. For the largest renal tumors, extraperitoneal extraction may be challenging. In those cases, initial retroperitoneal renal vasculature control with subsequent conversion to a transperitoneal dissection for tumor mobilization and specimen extraction is advantageous. Retroperitoneal laparoscopic nephrectomy is also routinely performed for benign renal lesions. The term "simple nephrectomy" is a misnomer; removal of nonfunctioning hydronephrotic kidneys and kidneys associated with chronic pyelonephritis can reflect particularly challenging renal dissections. 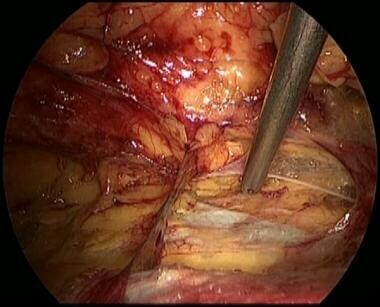 [6, 7] As with radical nephrectomy, early access to the major retroperitoneal structures is facilitated with retroperitoneal laparoscopic nephrectomy in this setting as well. In cases where renal infection and pyonephrosis are present, maintaining a retroperitoneal surgical field has the added advantage of localizing the infectious process to a contained space. There are no discreet contraindications specific to retroperitoneal laparoscopic nephrectomy. Indeed, many of the same conditions that prohibit any laparoscopic or open surgical intervention also apply to the retroperitoneal approach. Retroperitoneal access may be challenging in patients with prior retroperitoneal or percutaneous renal surgery and in patients with a history of pyelonephritis or genitourinary tuberculosis, which may lead to significant scarring and prevent adequate development of the retroperitoneum potential space required for renal dissection. Care should be used in patients with a history of abdominal aortic or iliac artery aneurysms in that these structures may be, in general, friable. In addition, the renal vasculature is often tortuous and distorted by a saccular aortic aneurysm. Intraoperative sonography with color Doppler using a 10-MHz laparoscopic probe is useful in defining complex renal vasculature in this and other settings. A thorough history should be obtained, and a physical examination should be performed prior to any RLN procedure. Special attention should be given to the following historical factors: anticoagulation, uncorrected bleeding diathesis, other malignancies, truncal obesity, prior retroperitoneal surgery, radiation therapy, renal ectopy, pyelonephritis, nephrolithiasis, or abdominal aortic or iliac artery aneurysms. In addition to routine examination of the patient's cardiovascular status, physical examination should note any palpable abdominal or flank tumor, as well as presence of any lymphadenopathy, peripheral edema, or varicocele. Desired studies include CBC count, basic metabolic profile, coagulation studies, liver function tests, and urine analysis and culture. Axial and coronal imaging of the abdomen and pelvis may be obtained with either CT scanning or MRI. Three-phase imaging (defining the parenchyma, vasculature, and collecting system) with either iodinated contrast or gadolinium is useful in defining pertinent anatomy. See the image below. Axial CT imaging demonstrating a 7 X 5 X 5 cm enhancing mass in the interpolar region of the right kidney. This 86-year old patient underwent a retroperitoneal, laparoscopic right radical nephrectomy. Thoracic imaging is useful as part of a metastatic evaluation and to define both cardiac and pulmonary issues that may affect the administration of general anesthesia. Nuclear bone scanning is reserved for patients with elevated alkaline phosphatase serum levels or for patients with specific sites of bony pain. Cerebral imaging is reserved for patients with neurological complaints or deficits. As with all intraperitoneal laparoscopic procedures, a general anesthetic is used for RLN. Large-bore intravenous access and radial arterial monitoring are routinely used. After induction of the anesthetic, a parenteral prophylactic antibiotic is administered. A transurethral Foley catheter is placed to monitor urine output during the procedure. Oro or nasogastric suction drainage is used for gastric decompression. Basic laparoscopic equipment includes the light source, carbon dioxide insufflator, main and accessory monitors, laparoscopic ports, and 30º and 45º laparoscopes. Accessory equipment, such as atraumatic graspers, right-angle laparoscopic clamps, laparoscopic scissors, dissectors (hook electrocautery, LigaSure or Harmonic scalpel), and specimen retrieval bags are routinely used. The patient is positioned in full flank with the ipsilateral side (ie, side of the lesion) elevated with the umbilicus centered over the break in the table. An axillary roll is routinely placed to protect the dependent brachial plexus. The operating table is flexed, with or without elevation of a kidney rest, to widen the space between the iliac crest and the costal margin. See the image below. The patient is placed laterally and padded with the ipsilateral side up. A kidney rest can be elevated, the table is flexed, and the patient placed in slight-Trendelenburg. The patient’s back is positioned flush to the side operating table where the surgeon and assistant stand. Care is taken to secure the patient to the table using cloth or silk tape and ensure that all pressure points are padded circumferentially. Adequate preoperative counseling is important to help reduce the risk of perioperative complications. Patients are counseled to stop anticoagulant therapy and to refrain from all agents that cause platelet dysfunction for at least one week preoperatively. A mechanical bowel preparation is routinely used. Both large and small bowel decompression facilitates development of the retroperitoneal space during balloon dissection and insufflation. Prophylactic oral and intravenous antibiotics are administered, with the agent determined by patient history and tolerance. Type and blood cross match is routinely obtained, and donor-directed blood is prepared based on preoperative parameters. Laparoscopic port positioning is subcostal, with the posterior port placed below the junction of the 12th rib and the paraspinous musculature. The middle endoscopic port is positioned just medial and below the tip of the 11th or 12th rib. From this position, after development of the retroperitoneal potential space, immediate endoscopic landmarks include the horizontally oriented psoas muscle and Gerota fascia. Anteriorly, the peritoneal reflection is identified and teased medially to allow for placement of the third laparoscopic port under direct vision. This prevents accident entry into the peritoneal cavity. After opening Gerota fascia posteriorly, the great vessels are noted medially, and the renal hilum is typically located at the junction of the inserting diaphragmatic muscle fibers with the psoas muscle. Early identification of the inferior vena cava (IVC) on the right, and the pulsating aorta on the left, is helpful to maintain correct orientation. The relationship between the great vessels and accessory vasculature, such as gonadal, adrenal, and lumbar vessels, is also routinely noted during dissection. The renal artery is identified as a pulsating, vertically oriented structure, with the renal vein often lying anterior to the artery. Lumbar vessels directly entering the renal vein are commonly encountered, frequently draping around the renal artery during left renal dissection. Landmarks noted during renal dissection include the extraperitoneal surfaces of the liver (right side) and spleen (left side). Complete dissection of the suprarenal IVC often defines not only the adrenal vasculature but also frequently the right hepatic vein. Meticulous dissection of the left renal vein before division with an endovascular stapling devise is key to preserving the superior mesenteric artery, which resides directly anterior. During right nephrectomy, the duodenum is also readily identified medially, and in most cases can be gently retracted anteriorly when developing the specimen. Surgical access to the retroperitoneum begins with a 1-cm transverse incision off the tip of the 11th or 12th rib. Subcutaneous tissues and underlying muscle are bluntly divided, defining the lumbodorsal fascia, which is gently traversed. Development of the retroperitoneum is then accomplished with a spherical balloon dissector, expanding and inflating parallel to the psoas muscle. Care must be taken not to dissect too anteriorly, as the peritoneum may be opened. Full inflation of the balloon dissector requires approximately 500-800 cc of air. See the image below. A retroperitoneal balloon access device, inflated with approximately 800 cc of air (AutoSuture PDB 1000, Covidien, Mansfield, Mass). A 10-mm port is then placed 1 cm below the 12th rib posteriorly, adjacent to the paraspinous musculature. Care is taken to avoid the neurovascular bundle along the inferior surface of the 12th rib. Insufflation and endoscopic inspection is performed thru the middle port. Typically a 3-port technique is used for RLN, but occasionally a fourth anterior port is required for specimen retraction. See the image below. 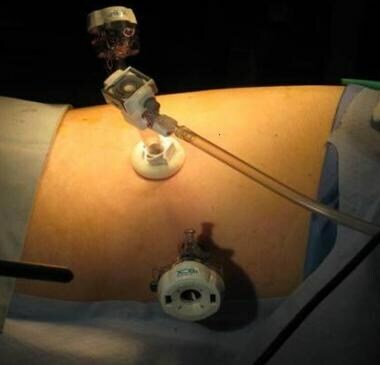 Intraoperative photograph demonstrating placement of the laparoscopic ports. The 10-mm laparoscope port is inserted just off the tip of the 12th rib, a 5-mm port is inserted approximately 8 cm anteriorly in the anterior axillary line, and a 12-mm port is inserted 1 cm below the 12th rib. To seal the middle port site, a 10-mm port with a balloon seal is used. Pneumoretroperitoneum at 15 mm Hg is then established. The anterior port is placed after endoscopic dissection is used to mobilize the peritoneum medially as described above. This third dissecting port (5 mm) is placed under direct vision in the midaxillary line, just lateral to the peritoneal reflection. Orientation of the endoscope and camera system is essential during retroperitoneoscopy. Opening Gerota fascia posteriorly with prompt localization of the great vessels and renal hilum is essential. The renal artery is identified as a vertically oriented, pulsating structure, perpendicular to the aorta. See the image below. The renal artery is identified as a vertically-oriented pulsating structure at the tip of the suction. The ureter, gonadal vessels, and great vessels (IVC for right sided tumors, pulsating aorta for left sided tumors) are first identified as longitudinal structures coursing parallel to the psoas. See the image below. The suction tip is pointing to the flattened inferior vena cava (IVC), which is running parallel to and medical to the horizontally-oriented psoas muscle tendon. The renal vessels are meticulously dissected free of adipose and lymphatics. See the image below. The renal artery and vein. The renal artery is typically secured with Weck (10 mm or 15 mm) and standard metal surgical clips. See the image below. The renal artery is typically secured with Weck clips (10 or 15 mm) and standard metal surgical clips. The renal vein is addressed with an endovascular GI anastomosis stapler (bladed or unbladed) using small vascular staples. See the image below. The renal vein is stapled allowing controlled division. Subsequent to hilar control, dissection turns cephalad dividing perirenal attachments with a haemostatic dissector (eg, LigaSure, Harmonic scalpel). The adrenal arcade of vessels are then developed if adrenalectomy is to be performed, with the adrenal vein being secured with clips and divided. The contents of Gerota’s fascia are then developed anterior, with blunt dissection used to separate Gerota’s fascia from the peritoneum. The extraperitoneal liver and duodenum on the right and the spleen and pancreatic tail on the left are landmarks. Finally, inferior attachments, including the ureter are divided. For specimen extraction, an extraperitoneal space inferiorly is developed through which a 15 mm laparoscopic port is introduced and a large entrapment sack is used. A small Gibson extraction incision around this port is created and the underlying fascia and musculature widened sufficiently to deliver the specimen. In contrast, specimen entrapment and morselization can also be performed. Perinephric drainage is not typically used, but if desired, a closed suction catheter is placed through the most dependent posterior port. Patient care is routine in the immediate postoperative period, with special care based most commonly on comorbidities. Diet is advanced promptly over the first 24 hours. The Foley catheter is routinely removed on the first postoperative day. Hospitals stays are commonly short (1-2 d). Randomized trials have compared RLN to transperitoneal laparoscopic nephrectomy (TLN). [15, 16, 17] The largest, by Desai et al, prospectively randomized 102 consecutive patients with renal masses to RLN or TLN. Compared with TLN, RLN demonstrated significantly shorter time to hilar control, as well as shorter operative time, with no differences observed for estimated blood loss, hospital stay, intraoperative or postoperative complications, or postoperative analgesia requirements. This study excluded obese patients with a body mass index (BMI) of greater than 35. Historically, there have been many studies reporting the physiologic advantages of retroperitoneal laparoscopy. A very recent prospective study out of Egypt studied these advantages. This group randomized 30 adult patients into 15 undergoing retroperitoneal laparoscopic nephroureterectomy and 15 transperitoneal laparoscopic nephroureterectomy for simple laparoscopic nephrectomy. Results showed that mean arterial pressure, heart rate, blood carbon dioxide level, peak airway pressure, and initial cerebral blood flow velocity were significantly greater with transperitoneal laparoscopic nephroureterectomy than retroperitoneal laparoscopic nephroureterectomy during the carbon dioxide insufflation period. This led the authors to conclude that retroperitoneal laparoscopic nephroureterectomy is not associated with greater effects on ventilatory, hemodynamic, and cerebral functions compared with transperitoneal laparoscopy. Gupta et al compared 505 RLN to 112 open nephrectomies for benign pathology and found decreased blood transfusions (0.8% vs 4.5%) and decreased intraoperative (7.5% vs 22.4%) and postoperative (5.1% vs 22.3%) complications compared with open;  29 conversions (5.7%) were reported, nearly half of which were in the first 100 consecutive patients. Liapis et al reviewed complications from 600 retroperitoneoscopic procedures performed over 10 years, including 284 cases of RLN. They describe 15 transfusions (5.3%), 15 conversions (5.3%), and 12 surgical complications (4.2%). The retroperitoneal endoscopic approach is well suited for radical or simple nephrectomy, with balloon dilatation creating a reliable and safe way to perform surgical interventions in the developed potential space. Patient oncological and functional outcomes are excellent, equivalent or superior to the transperitoneal approach, with particular efficacy in those who have undergone prior intra-abdominal surgery with peritoneal adhesions. The indications for retroperitoneal laparoscopy continue to expand, with development and refinements in surgical technique. For example, single-port laparoscopy has been applied to the retroperitoneal space, with small series recently being reported. 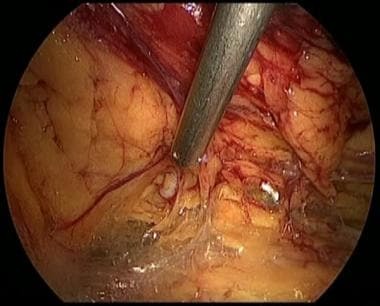 [30, 31] As surgeons become familiar with this technique, retroperitoneoscopy will continue to evolve, crafting new surgical interventions for other disorders. Recent examples include staging and therapeutic retroperitoneal endoscopic lymph node dissections, and retroperitoneal aortic therapies for Type II endoleaks post percutaneous aortic endosleeve graft placement. How have extraperitoneal nephrectomy techniques evolved? What are the indications for extraperitoneal nephrectomy? What are the contraindications for extraperitoneal nephrectomy? What is included in the preoperative evaluation prior to extraperitoneal nephrectomy? How is the patient prepped for extraperitoneal nephrectomy? What equipment is needed to perform an extraperitoneal nephrectomy? 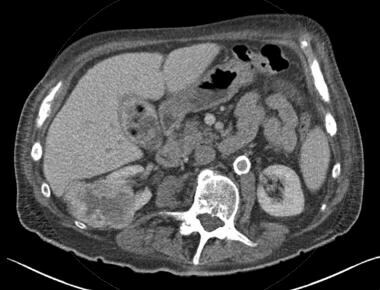 How is the patient positioned for an extraperitoneal nephrectomy? How are the possible complications of extraperitoneal nephrectomy prevented? What is the anatomy of the kidney relevant to extraperitoneal nephrectomy? How is an extraperitoneal nephrectomy performed? What is included in the postoperative care following an extraperitoneal nephrectomy? What is included in the long-term monitoring following an extraperitoneal nephrectomy? What are the reported outcomes for extraperitoneal nephrectomy? What are the possible complications of extraperitoneal nephrectomy? How do the outcomes for extraperitoneal nephrectomy compare to a transperitoneal approach? How are the indications for extraperitoneal nephrectomy expanding? Clayman RV, Kavoussi LR, Soper NJ, Dierks SM, Meretyk S, Darcy MD. Laparoscopic nephrectomy: initial case report. J Urol. 1991 Aug. 146(2):278-82. [Medline]. Bartel M. Retroperitoneoscopy: An endoscopic method for inspection and bioptic examination of the reteroperitoneal space [in German]. Zentralbl Chir. 1969. 95:377-83. Gaur DD, Agarwal DK, Purohit KC. Retroperitoneal laparoscopic nephrectomy: initial case report. J Urol. 1993 Jan. 149(1):103-5. [Medline]. Gaur DD. Retroperitoneoscopy: the balloon technique. Ann R Coll Surg Engl. 1994 Jul. 76(4):259-63. [Medline]. [Full Text]. O'Malley RL, Godoy G, Kanofsky JA, Taneja SS. The necessity of adrenalectomy at the time of radical nephrectomy: a systematic review. J Urol. 2009 May. 181(5):2009-17. [Medline]. El-Ghoneimi A, Abou-Hashim H, Bonnard A, Verkauskas G, Macher MA, Huot O. Retroperitoneal laparoscopic nephrectomy in children: at last the gold standard?. J Pediatr Urol. 2006 Aug. 2(4):357-63. [Medline]. Hemal AK, Mishra S. Retroperitoneoscopic nephrectomy for pyonephrotic nonfunctioning kidney. Urology. 2010 Mar. 75(3):585-8. [Medline]. Kohei N, Kazuya O, Hirai T, et al. Retroperitoneoscopic living donor nephrectomy: experience of 425 cases at a single center. J Endourol. 2010 Nov. 24(11):1783-7. [Medline]. Gill IS, Sung GT, Hobart MG, Savage SJ, Meraney AM, Schweizer DK. Laparoscopic radical nephroureterectomy for upper tract transitional cell carcinoma: the Cleveland Clinic experience. J Urol. 2000 Nov. 164(5):1513-22. [Medline]. Pyo P, Chen A, Grasso M. Retroperitoneal laparoscopic partial nephrectomy: surgical experience and outcomes. J Urol. 2008 Oct. 180(4):1279-83. [Medline]. El-tohamy SA, Shello HM. 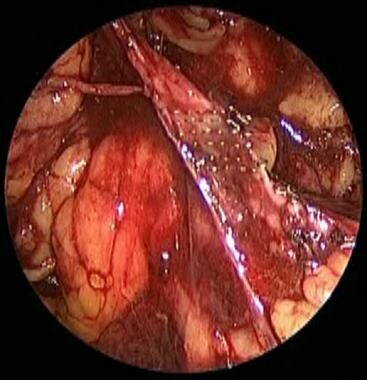 Retroperitoneal versus transperitoneal laparoscopy for simple nephrectomy. Egyptian J Anaesthesia. 2013 Apr. 29(2):109-16. [Guideline] Motzer RJ, Agarwal N, Beard C, et al. National Comprehensive Cancer Network (NCCN) clinical practice guidelines in oncology (NCCN guidelinesTM): Kidney cancer. National comprehensive cancer network. Available at http://www.nccn.org/professionals/physician_gls/f_guidelines.asp. Accessed: Dec 27, 2010. Fu J, Ye S, Ye HJ. Retroperitoneal Versus Transperitoneal Laparoscopic Partial Nephrectomy: A Systematic Review and Meta-analysis. Chin Med Sci J. 2015 Dec. 30 (4):239-44. [Medline]. Ren T, Liu Y, Zhao X, Ni S, Zhang C, Guo C, et al. Transperitoneal approach versus retroperitoneal approach: a meta-analysis of laparoscopic partial nephrectomy for renal cell carcinoma. PLoS One. 2014. 9 (3):e91978. [Medline]. Benoit T, Peyronnet B, Roumiguié M, Verhoest G, Beauval JB, Delreux A, et al. Laparoscopic nephrectomy for polycystic kidney: comparison of the transperitoneal and retroperitoneal approaches. World J Urol. 2015 Dec 10. [Medline]. Desai MM, Strzempkowski B, Matin SF, Steinberg AP, Ng C, Meraney AM. Prospective randomized comparison of transperitoneal versus retroperitoneal laparoscopic radical nephrectomy. J Urol. 2005 Jan. 173(1):38-41. [Medline]. Berglund RK, Gill IS, Babineau D, Desai M, Kaouk JH. A prospective comparison of transperitoneal and retroperitoneal laparoscopic nephrectomy in the extremely obese patient. BJU Int. 2007 Apr. 99(4):871-4. [Medline]. Wang L, Wang L, Yang Q, Xiao C, Sun Y. Retroperitoneal laparoscopic and open radical nephrectomy for T1 renal cell carcinoma. J Endourol. 2009 Sep. 23(9):1509-12. [Medline]. Ha US, Hwang TK, Kim YJ, Oh TH, Jeon YS, Lee W. Comparison of oncological outcomes of transperitoneal and retroperitoneal laparoscopic radical nephrectomy for the management of clear-cell renal cell carcinoma: a multi-institutional study. BJU Int. 2010 Sep 3. [Medline]. Okegawa T, Noda H, Horie S, Nutahara K, Higashihara E. Comparison of transperitoneal and retroperitoneal laparoscopic nephrectomy for renal cell carcinoma: a single-center experience of 100 cases. Int J Urol. 2008 Oct. 15(11):957-60. [Medline]. Cico A, Salomon L, Hoznek SF, Chopin D, Abbou CC. Retroperitoneal laparoscopic surgery and carcinogenic risk. Prog Urol. Feb 2001. 11(1):8-15. Grasso M, Fishman AI, Cohen J, Alexander B. Ureteroscopic and extirpative treatment of upper urinary tract urothelial carcinoma: a 15-year comprehensive review of 160 consecutive patients. BJU Int. 2012 Dec. 110(11):1618-26. [Medline]. Berger A, Haber GP, Kamoi K, Aron M, Desai MM, Kaouk JH. Laparoscopic radical nephroureterectomy for upper tract transitional cell carcinoma: oncological outcomes at 7 years. J Urol. 2008 Sep. 180(3):849-54; discussion 854. [Medline]. Takei A, Sazuka T, Nakamura K, Nihei N, Ichikawa T. Port-site transversus abdominis fascia closure reduced the incidence of incisional hernia following retroperitoneal laparoscopic nephrectomy. Hernia. 2016 May 26. [Medline]. Gupta NP, Hemal AK, Mishra S, Dogra PN, Kumar R. Outcome of retroperitoneoscopic nephrectomy for benign nonfunctioning kidney: a single-center experience. J Endourol. 2008 Apr. 22(4):693-8. [Medline]. Liapis D, de la Taille A, Ploussard G, et al. Analysis of complications from 600 retroperitoneoscopic procedures of the upper urinary tract during the last 10 years. World J Urol. 2008 Dec. 26(6):523-30. [Medline]. [Full Text]. Ryu DS, Park WJ, Oh TH. Retroperitoneal laparoendoscopic single-site surgery in urology: initial experience. J Endourol. 2009 Nov. 23(11):1857-62. [Medline]. White WM, Goel RK, Kaouk JH. Single-port laparoscopic retroperitoneal surgery: initial operative experience and comparative outcomes. Urology. 2009 Jun. 73(6):1279-82. [Medline].